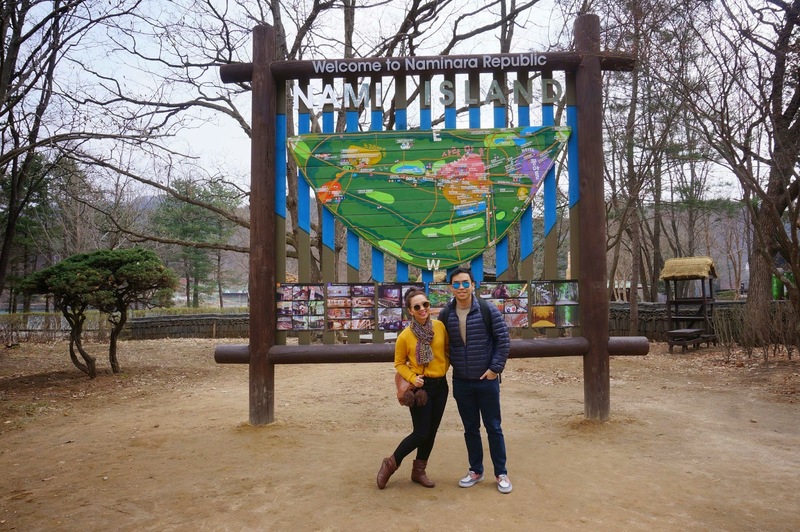 ChaMike falls in love at Nami Island. 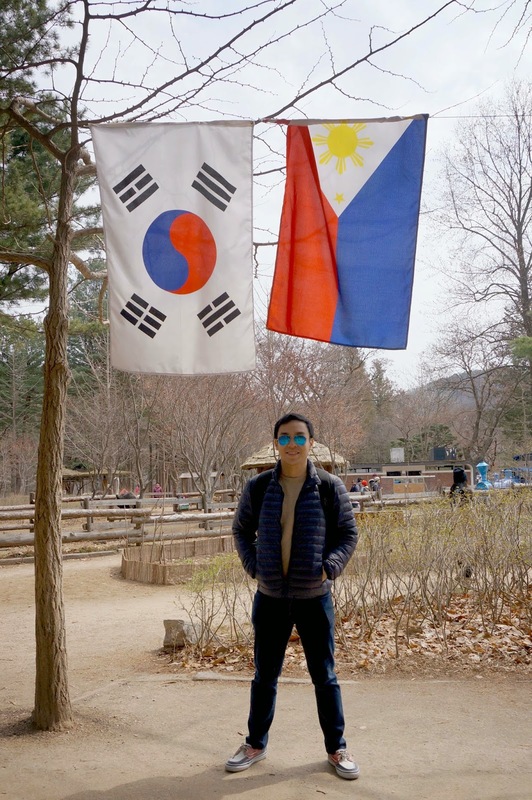 One of the reasons why I wanted to visit Seoul was because of Nami Island. 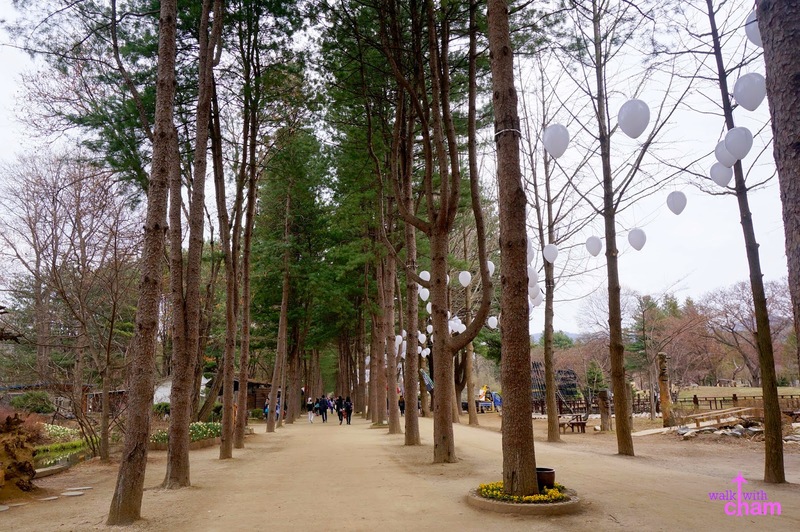 I am not really a fan of the whole Koreanovela craze but the picturesque lane of beautiful tall trees (winter, autumn or not) was just so irresistible to miss. 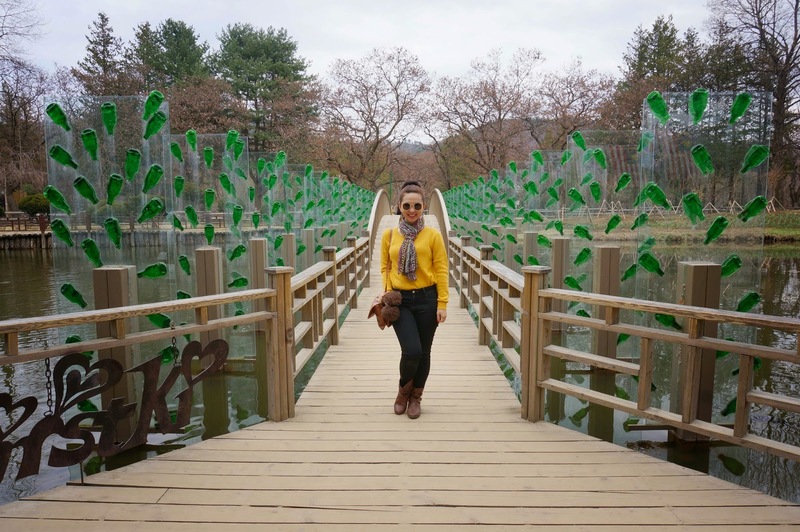 Indeed Nami Island was breathtaking! I cannot imagine myself going here without Mike. 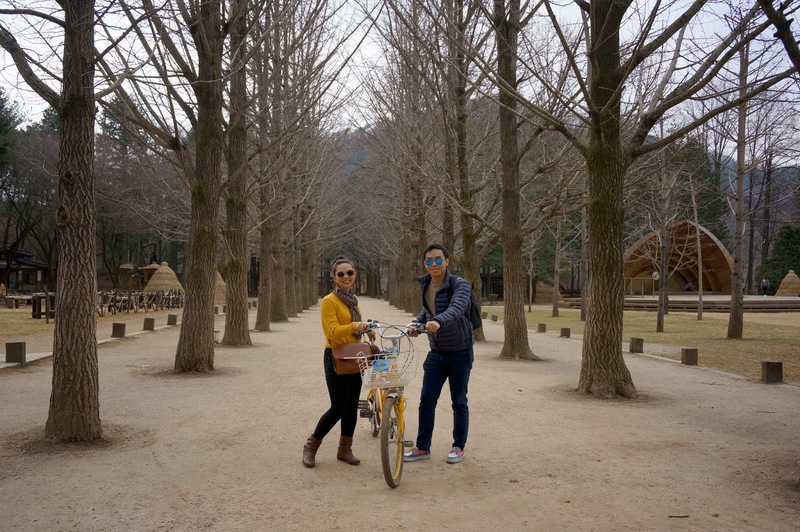 This island was so romantic that we even felt as if we were in the Korean drama, Winter Sonata. 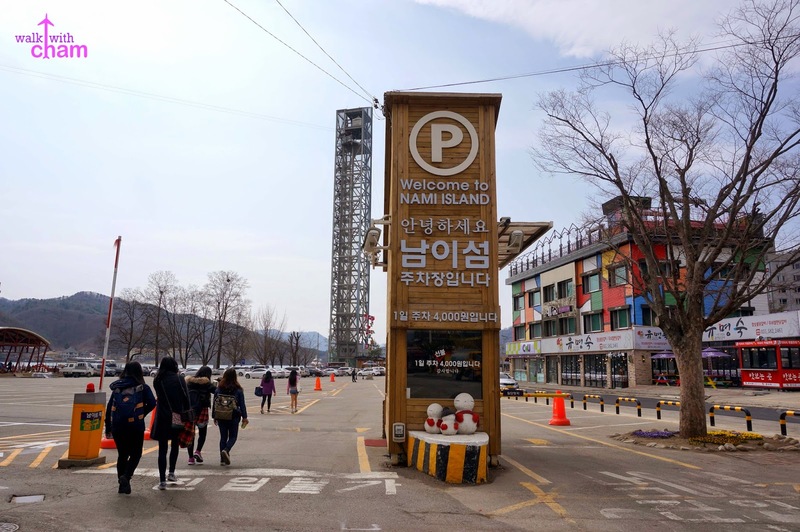 Just right outside Gapyeong Station there is a shuttle bus and taxi terminal. You can take either of the two. 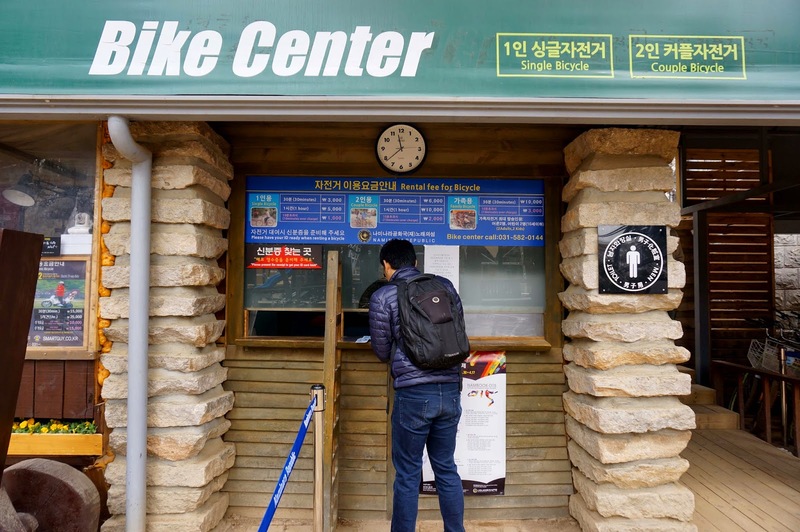 My first option was of course the shuttle bus because it's cheaper, but riding it can be tricky as it has a scheduled time of departure which is an hour interval. Good thing when we got out of the station a bus was outside as if waiting for us two. What is luck? 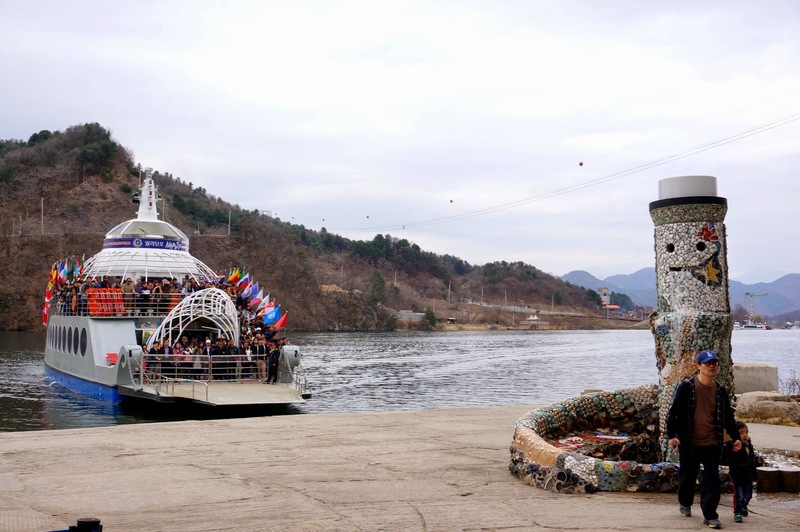 After buying our tickets from Gapyeong wharf we rode a ferry to reach the island. After a quick 5-6 minute ride we were transported to the enchanting island. 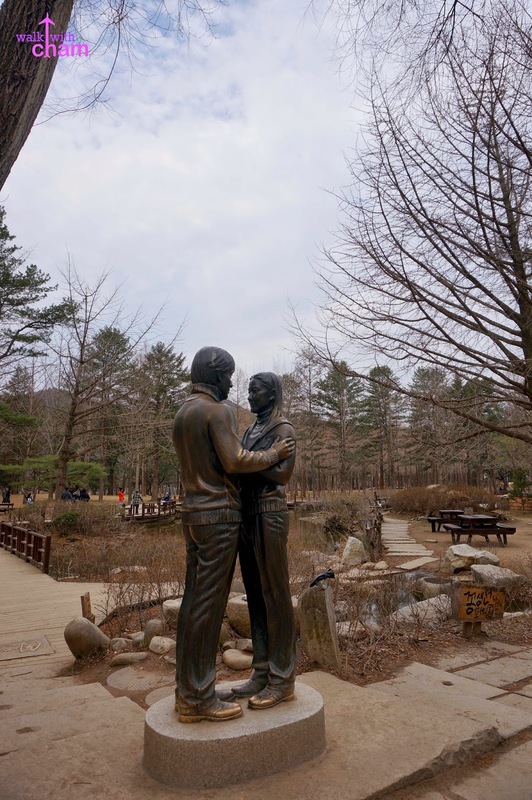 Nami Island became famous for one of the most successful Korean dramas, Winter Sonata. 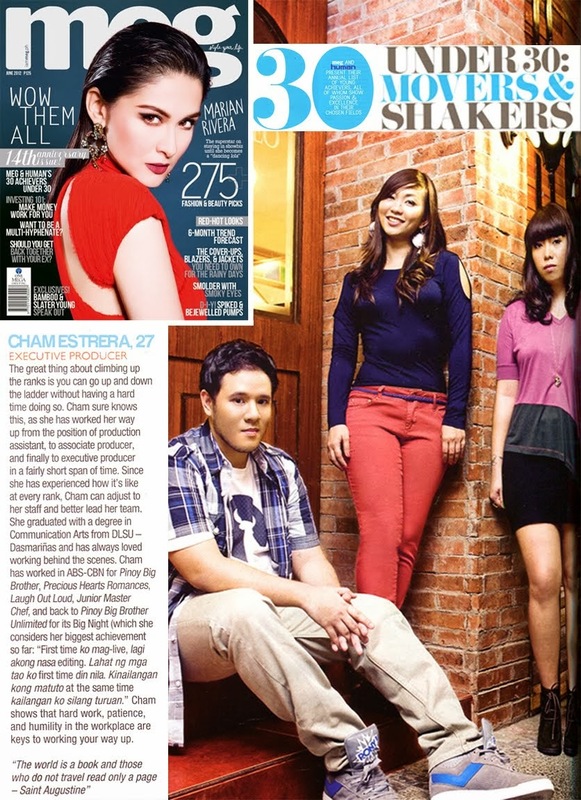 We have yet to watch it but ChaMike instantly fell for Nami as soon as we stepped on the island's soil. 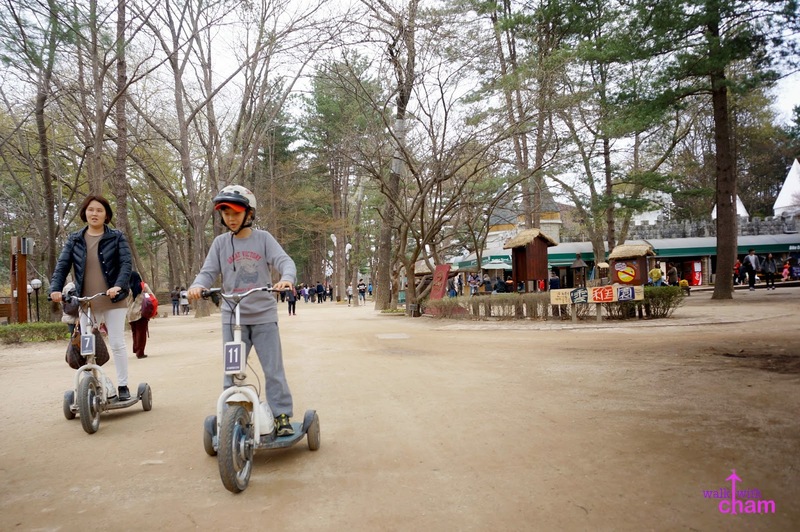 Nami Island got its name from General Nami. 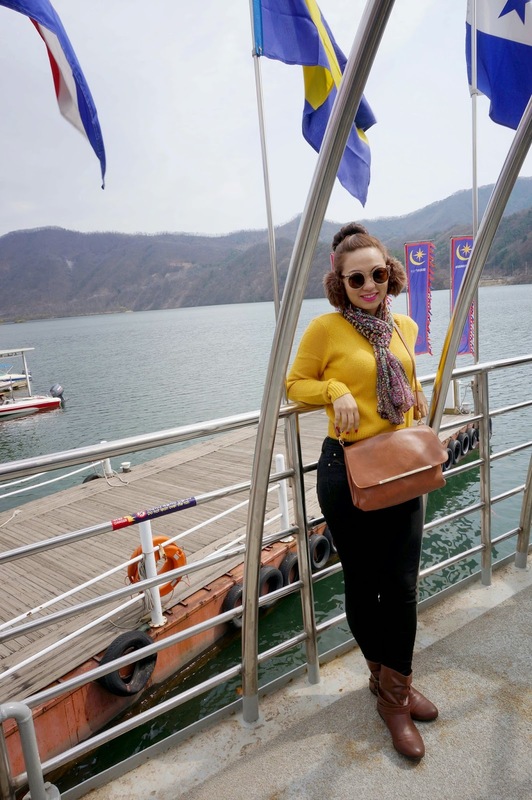 Here in this island is where the grave of the well-known general is located. 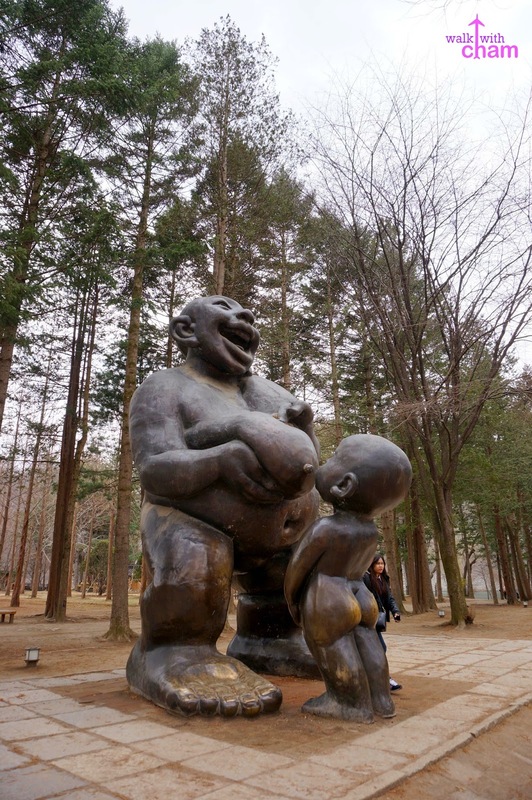 He was famous for leading a great victory against the rebels during King Sejo's reign of the Joseon Dynasty. 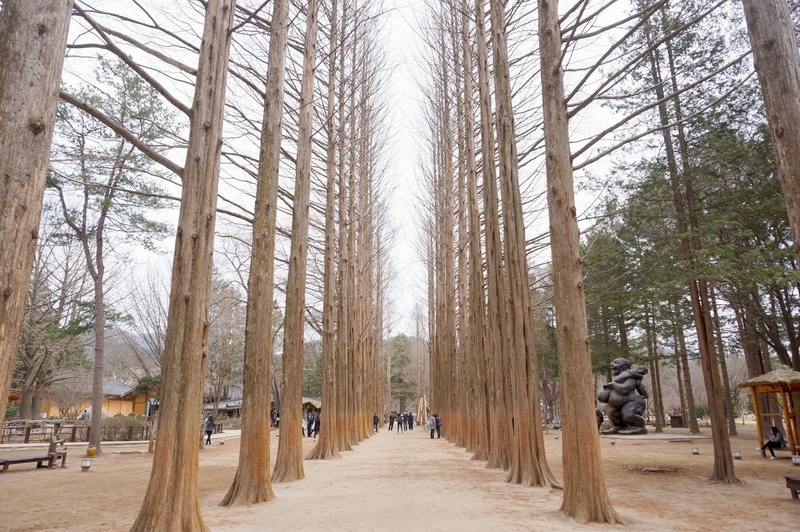 The island's main attraction is definitely the rows of beautiful lined trees of different kinds- Korean pine trees, metasequoia trees, ginko trees and cherry blossom trees. Having all these beautiful trees in one island makes it perfect for all kinds of seasons - winter, spring, summer and fall. 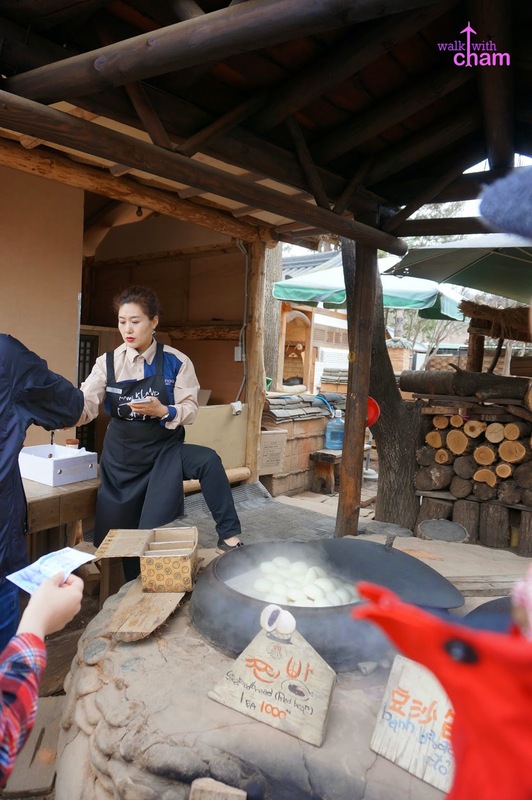 It's most popular during autumn and winter. I can just imagine during autumn when this beautiful walking path turns into color yellow. 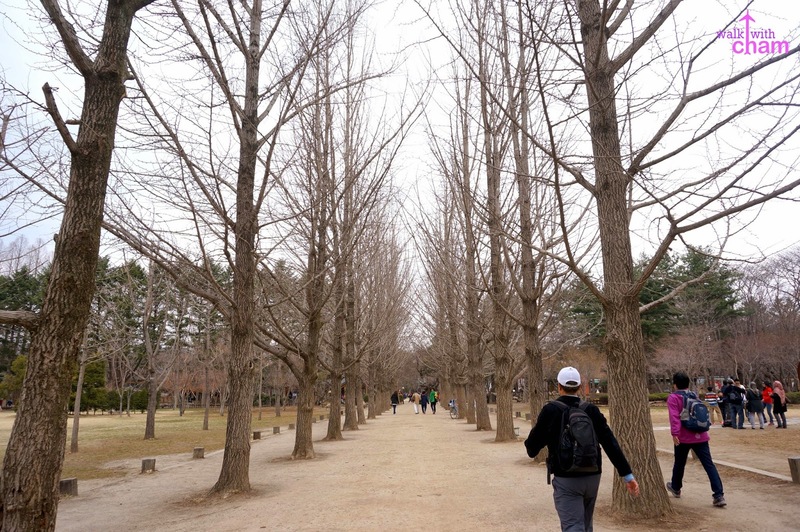 The autumn foliage in this ginko trees is a famous site on this island. But of course the withered effect didn't disappoint as well. 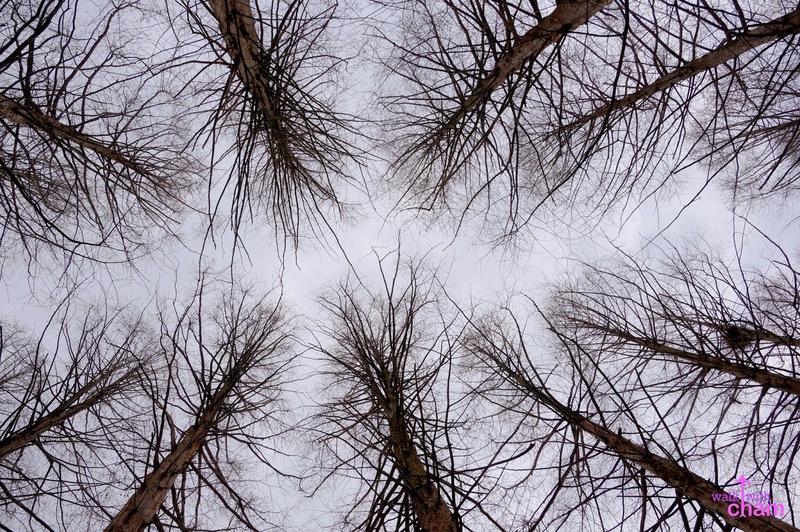 Another famous walking path is the lane of metasequioa trees that is beautiful during winter and autumn. 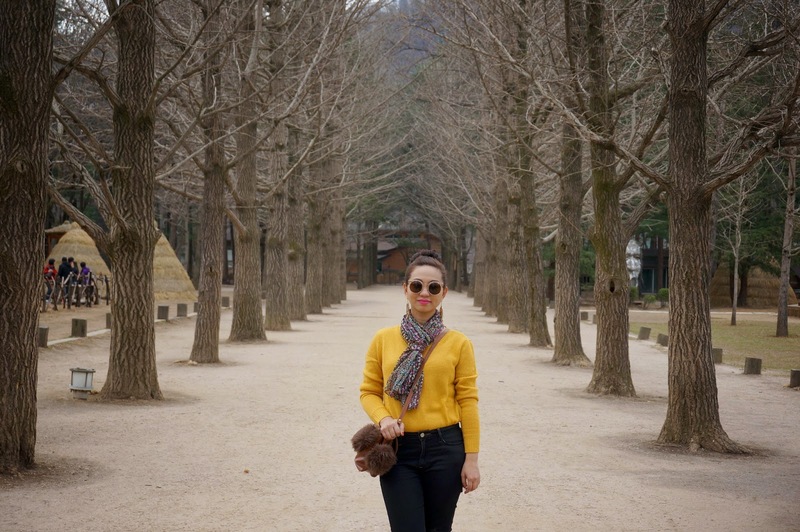 This is also the spot where a famous scene from the movie Winter Sonata was shot. 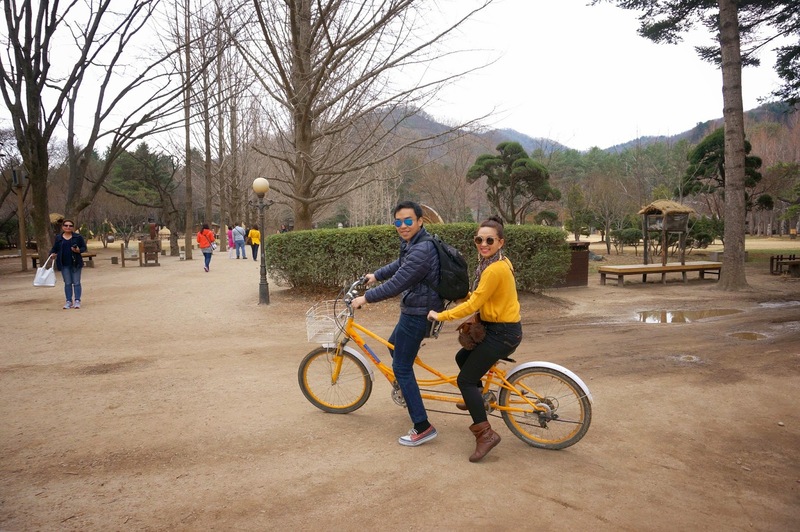 For a more romantic stroll, try biking in tandem. 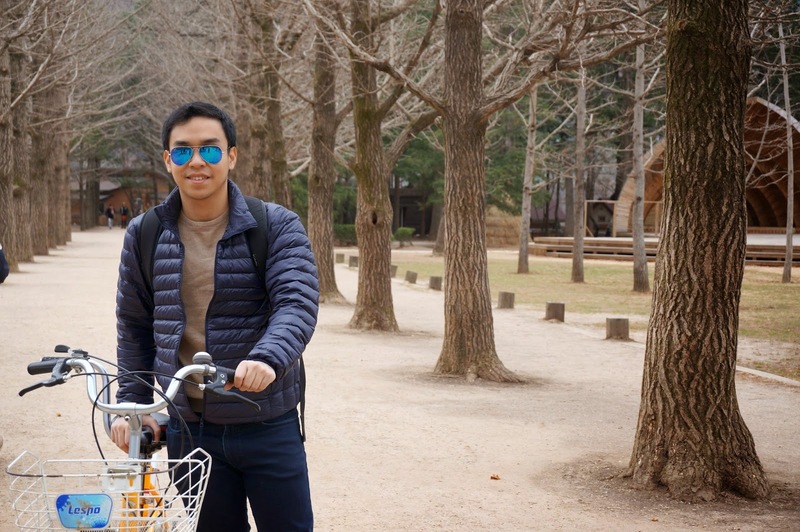 ChaMike got its fondness of riding bicycles last year in Kyoto (Read: Biking around Kyoto Japan). 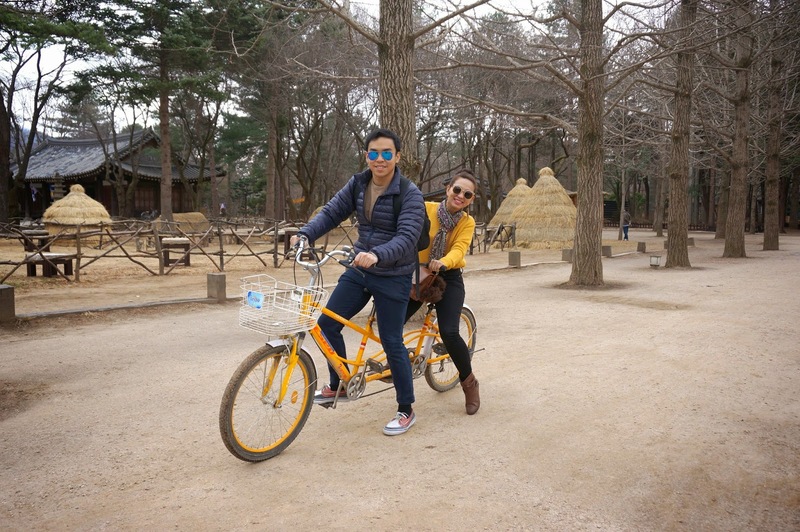 So of course this was our main agenda when we visited Nami and this time we tried the tandem bike. 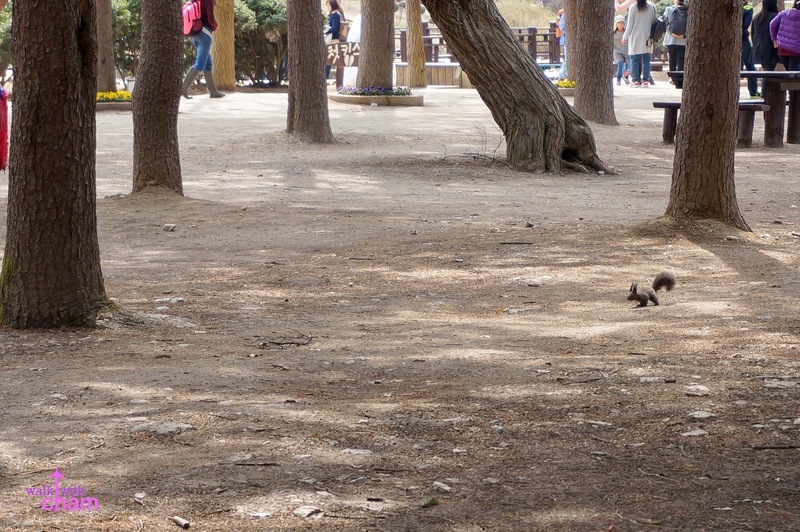 It was a surprise discovering that Nami Island has squirrels. Our first time to actually see one! hehehe. Mike being an animal lover chased and took as many shots as he could. Here are some decent ones. 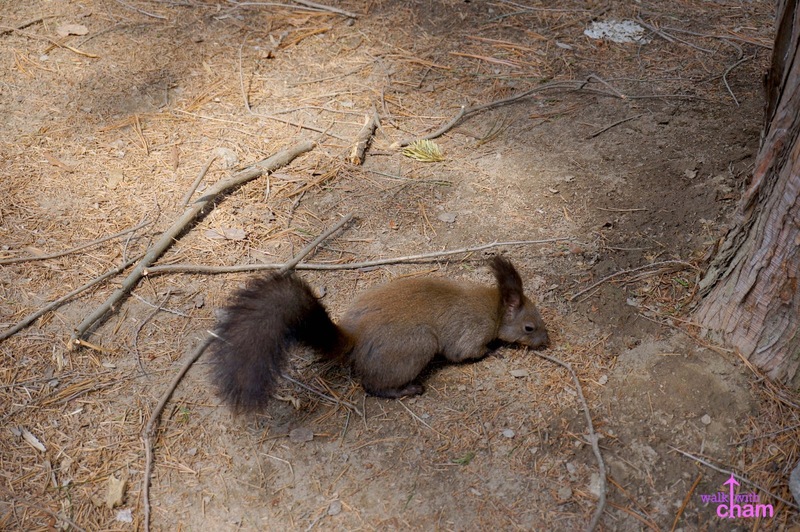 oh mr squirrel isn't afraid of humans! Perfect timing! 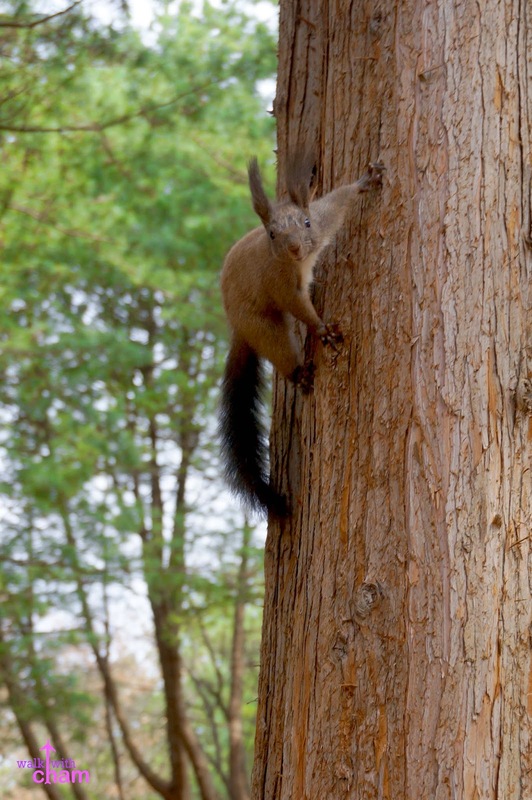 Little squirrel staring at the camera! 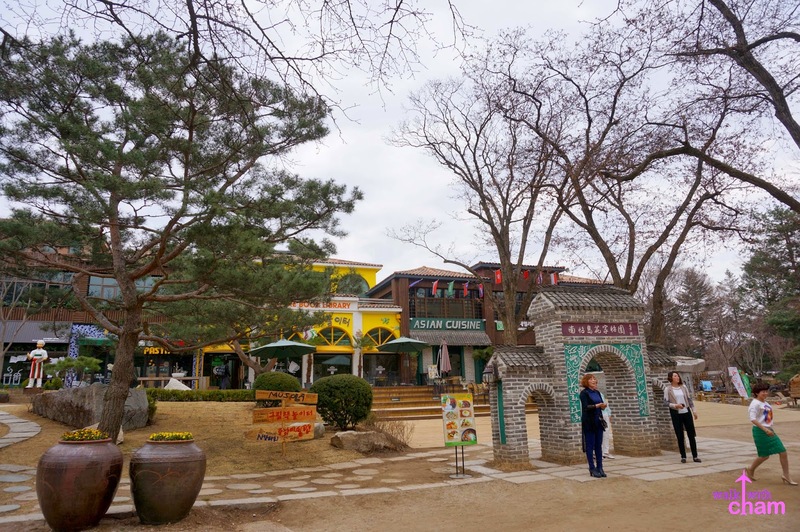 The island houses a number of restaurants as well. 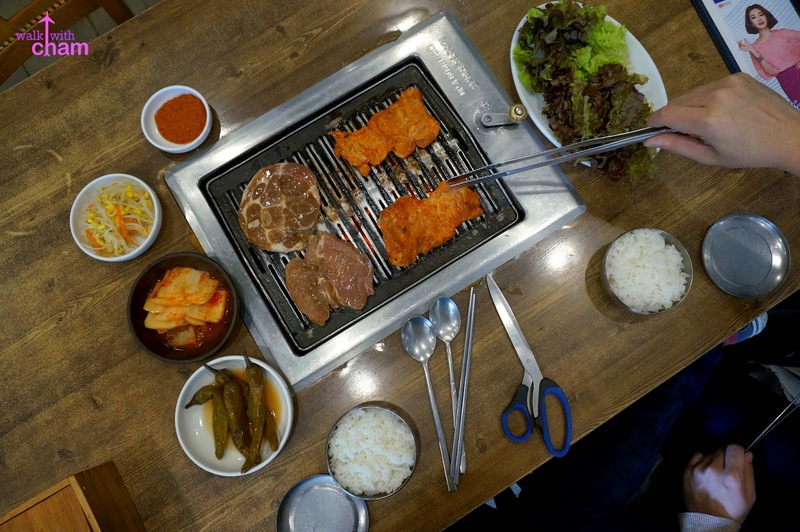 We had an authentic Korean barbecue lunch at one of the restaurants here before going to our next stop- Petite France. 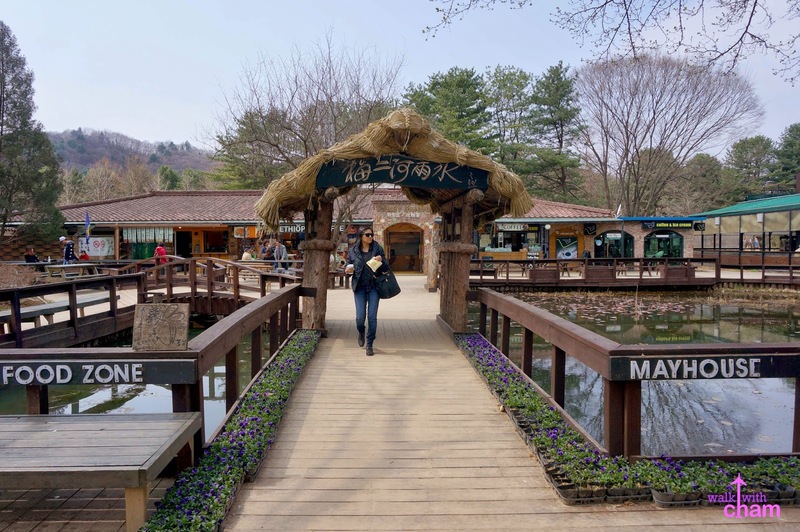 After that filling lunch it was time to say goodbye to the lovely Nami Island and off we went to another tourist spot, Petite France. 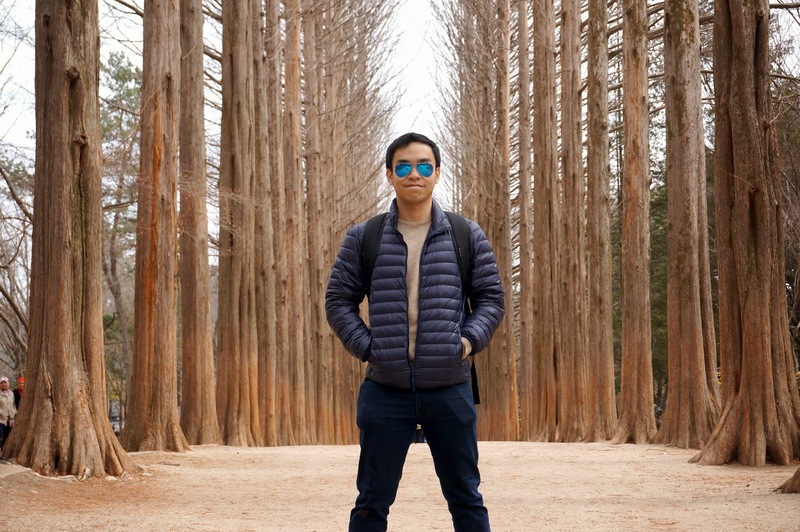 Hi Cham, it's a very useful blog for me who going to travel to Korea with my gf soon...However, one of the question is how u guys manage to take those couple photo? 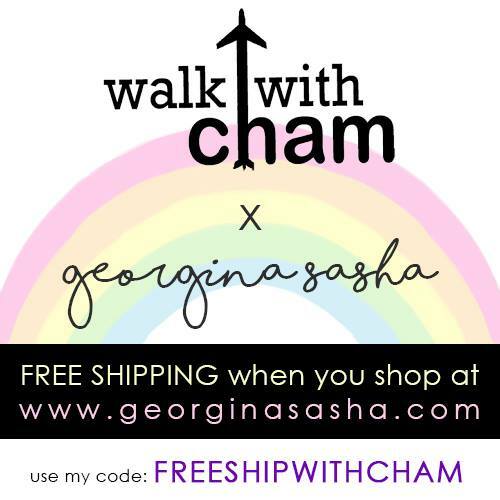 Ask for help from other visitors too? We are wondering what month you travel there? 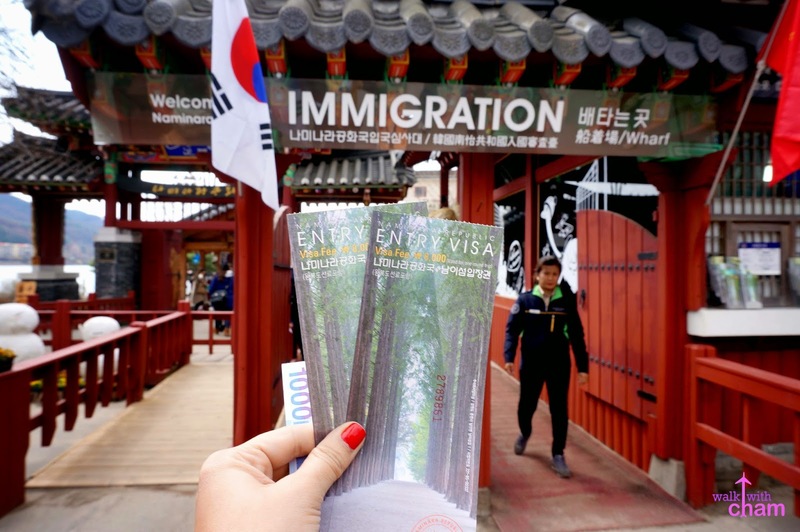 And can u give us suggestion, what time is the right time to travel there during autumn? 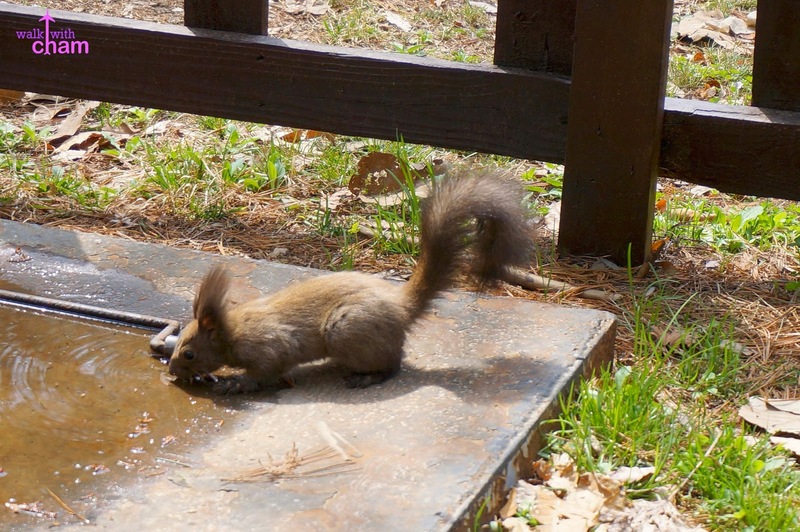 It was during spring, early April :) I would love to visit it during autumn though!